Inspired by this recipe for zucchini bread, the hand held version is just as tasty and a wonderful way to add vegetables to your diet. 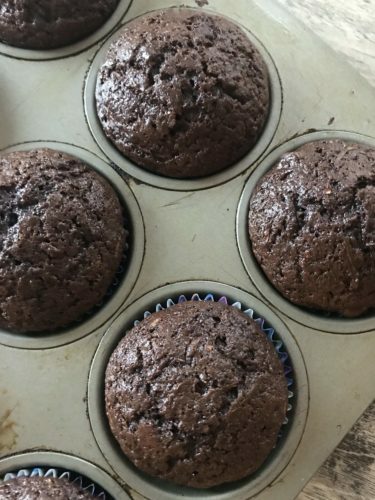 Make these healthy muffins for breakfast or a snack to take along to work or camp this summer. 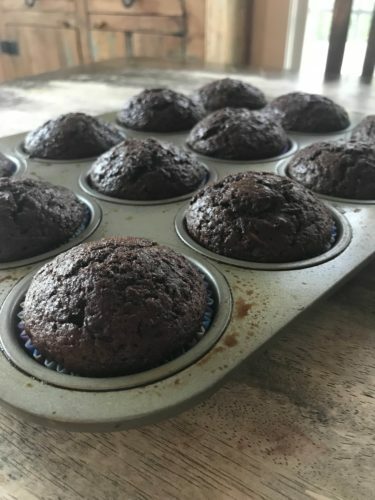 Preheat oven to 350-degrees F. Line a 12-cup muffin pan with paper liners. In a large bowl whisk together flours, cocoa, baking soda, salt and cinnamon; set aside. Using an electric mixer, combine sugar canola oil and applesauce; mix on low until combined. Add eggs, vanilla extract and lemon juice and mix on low speed until well combined. Slowly add flour mixture and mix until just combined. Using a spatula, fold in zucchini and chocolate chips. Use an ice cream scoop to divide the batter evenly in the muffin pan. Transfer to the oven and bake for 20 minutes or until the toothpick inserted into the center of a muffin comes out clean. Set aside to cool.